The History Project: "Gipsie's shewing a Prize Cat"
Brief History Although expressed in satire, this social commentary piece is an early indication of the concept of a society whose purpose is the controlled breeding of cats. 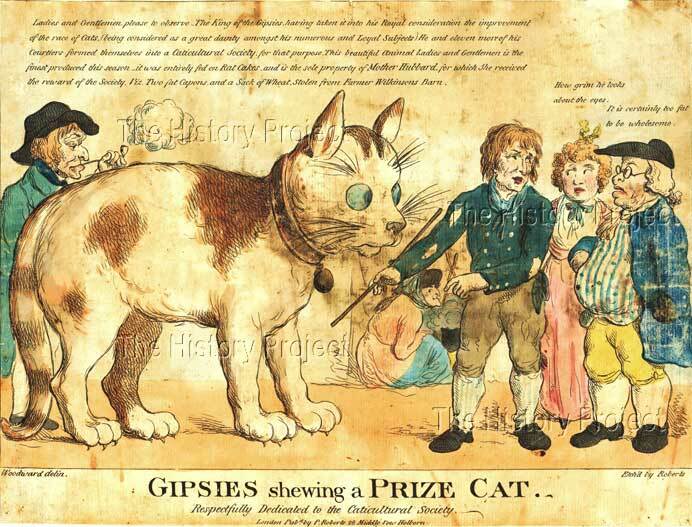 "GIPSIES shewing a PRIZE CAT"
George Murgatroyd Woodward (1760-1809) (aka George Moutard Woodward), was a popular English amateur caricaturist and humourist. The son of a Derbyshire squire, he was affectionately nicknamed by his friends as 'Mustard George'. He is widely acknowledged as a pioneer of English caricature. As a humourist, he was admired for the doggerel texts appended to his prints, which were predominantly satirical social commentaries. In the main he worked to make money, which was usually spent in the local ale houses with his drinking partner, the printer and engraver, Thomas Rowlandson. 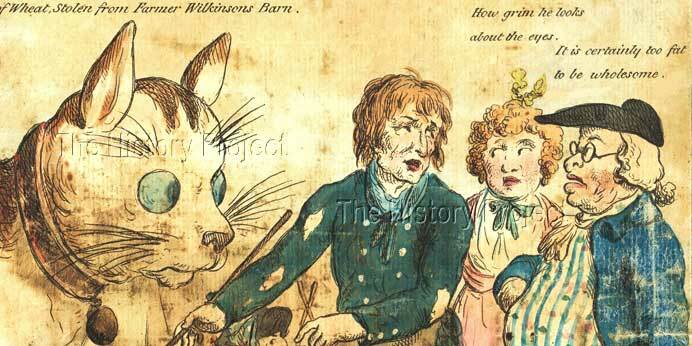 A great majority of his drawings were in fact etched by either Thomas Rowlandson or Isaac Cruikshank. Although intensely aware of both high and low culture, and attentive to contemporary politics, Woodward seemed absorbed in the humour to be found in everyday life, his caricatures providing an intriguing insight into both the tastes and fashions of 18th century England. In this piece, which is entitled "GIPSIES shewing a PRIZE CAT" and humorously dedicated to the 'Caticultural Society', Woodward unwittingly forecasts a future in which a society exists expressly for the breeding and shewing of 'Prize Cats'. And what a prophetic statement that is! Even in this satirical form, this is certainly the earliest indication found to date of such a concept being held in the mind of an Englishman. Amazingly, this publicly declared concept of 'shewing a prize cat' actually predates the establishment of formal cat shows by at least 70 years and the formation of an English National Cat Club, by approximately 90 years! "Ladies and Gentlemen, please to observe, the King of the Gipsies, having taking it into his Royal consideration the improvement of the race of Cats (being considered as a great dainty amongst his numerous and Loyal subjects) He and eleven more of his Courtiers, formed themselves into a Caticultural Society for that purpose. This beautiful animal Ladies and Gentlemen, is the finest produced this season.. it was entirely fed on Rat Cakes and is the sole property of Mother Hubbard for which she received the reward of the Society, viz, Two fat Capons and a sack of wheat, stolen from Farmer Wilkinson's Barn." "How grim he looks about the eyes" observes the wife, nervously suspicious of both the size and expression of the cat. "It is certainly too fat to be wholesome" agrees the Squire, who to all intents and purposes, may as well have been describing himself! One copy of this wonderfully satirical, extremely rare, and prophetic piece, which unknowingly heralds the establishment of a "cat fancy", is preserved in a unique collection of George Murgatroyd Woodward's works held by the Derbyshire County Council. This copy of the well-over 200 year old print became available at auction in Cyprus in early 2013 and was duly purchased for The Harrison Weir Collection.